What else is in STORE for Spunkee Monkee?? Well! That's a GREAT word for this next update! Our update from Friday had us taking a sneak peek into the Monkee Closet. But what happens when you find a few items that you already have? Maybe - Monday you get a Black hat. Thursday, you find a Red hat. Saturday ... you find another Black hat? You can't wear two hats at the same time, so what to do with extra accessories? 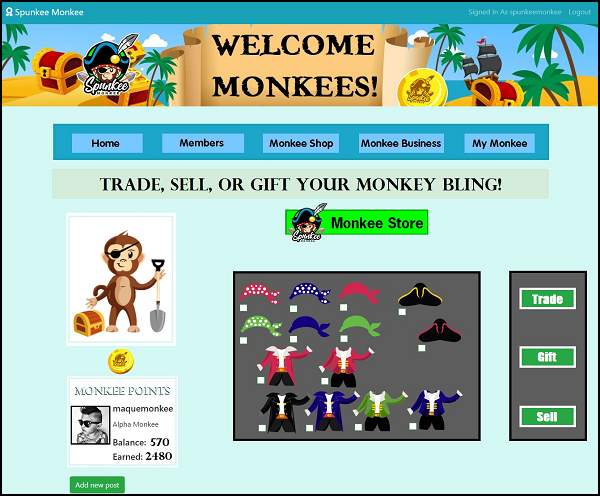 How about THREE OPTIONS in the Monkee Shop! Gift it to other Monkee friends!Wow! We can do that? Yep! If a Monkee friend hasn't found that particular item and they would love to wear it- go ahead and gift it to them! Trade it!Why not?! You can set up a sweet deal with a friend and trade one of your items with your Monkee friend! Maybe make some new friends as you set up your barter! Sell it back to the Monkee Shop! Oooh la la! You mean we can actually sell our items? Yepper! But how much can I sell my accessories for? Well.. Hmmmmm. 😉 I think I've revealed enough for today! Come back tomorrow for more excitement! 50 Steem contest for MONKEES!! You know you want to! As always, @fundition has amazing support! Not just in upvotes...but help, encouragement and a cheerleading presence!!!! these Monkee's are going to LOVE this! hahahahahaha!!!!! that makes me giggle for 2 reasons!